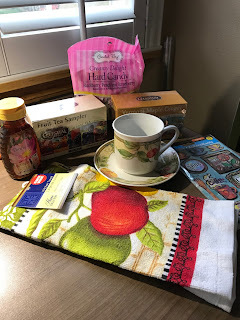 Stephanie from The Enchanting Rose hosts a yearly teacup and/or mug exchange, and this year I just happened to see her post saying that the deadline was in a few days. It sounded like such fun that I clicked the sign up even before reading all of the rules! Stephanie matches women up from around the world, and then emails you your soon-to-be-new friend. The fun part starts after that when you get to go shopping for a teacup or coffee mug that your new friend indicated as her favorite. Regina in Arizona was given my name, and she outdid herself and sent me the wonderful goodies you see at the top of this post. I'm attaching a link to her blog so you can get to know her as well. Stephanie sent me a detailed email about my teacup partner, Kris! She included lots of tidbits that Kris shared about herself. Kris recently moved to Oregon. How fun is that! She also is a hot chocolate gal - I liked her already! My gift package didn't have far to travel to her. It was a blast finding items that I thought she would love. A link to Kris's blog is above (she actually has 2 blogs!) so be sure to check them both out. I gained three new friends by stepping out and participating in this exchange. Stephanie, our wonderful hostess in all this fun, Kris, and Regina. Thank you ladies! I look forward to reading your blog updates and gearing up for the 2018 Teacup Exchange. Until then I'll be thinking of you each time I enjoy a cup of tea. Hey there Karen! It’s me JoJo in Oregon. You may not remember me, but yes, I’ve been following you for years. You even sent me information on your quilt frame years ago. I think she has a link where you can join and get an email when she is ready to do another one. Thanks so much for commenting! Regina is a dear and sweet lady, whom I'm quite sure you will enjoy getting to know. Such a lively gift package she sent your way. I've come over to visit with you from my dear Stephanie's party. So nice to "meet" you. Beautiful gifts and what a fun exchange! Both packages are great! It is so fun participating in the exchange, isn't it? I loved the cup you sent out...so unique! Both packages are simply lovely and I must say I like how the one from Regina had a "fallish" feel to it. And oh, the tea cup you sent to Kris is quite stunning! What fun to come and visit with you and see the pretty things you both sent and received. It's only my second time to play along and I can't wait for the next one! JoJo I'm going to have to sneak over to Kris house and raid her chocolate stash! Such lovely packages being exchanged! I'm intrigued by the Vermont Maple Ginger Tea! Hi JoJo - so glad you joined in the fun this time......if you are anything like me, once you start you cannot stop! It is SO much fun! Stephanie is a blessing to us all, indeed.